The European Commission will study a Russian-Polish gas deal to make sure it complies with European Union legislation, European Commission President Jose Manuel Barroso said on following a meeting with Poland's President Bronislaw Komorowski. Poland's Prime Minister Donald Tusk said on Tuesday that an agreement to supply gas via the Yamal-Europe pipeline would be signed in the next 10-12 days after consultations with the European Commission. Tusk said the consultations would only concern EuRoPol Gaz, the operator and owner of the Polish part of the Yamal-Europe pipeline which carries gas from Russia's Yamal peninsula to Europe. Under the new Russian-Polish agreement, two state monopolies, Russia's Gazprom and Polskie Gornictwo Naftowe i Gazownictwo SA, or PGNiG, will finish upgrading EuRoPol Gaz and will each get a 50 percent stake in it. Gazprom and PGNiG now hold 48 percent each in EuRoPol Gaz, with the remaining four percent belong to Gas-Trading S.A., in which more than 80 percent of shares belong to Polish companies. The Polish side, which has slightly more votes in EuRoPol Gaz, wanted to increase the transit price, which Gazprom opposed. The companies hope that the new agreement will put an end to the dispute. Hungary is expected to join the Azerbaijani-Georgian-Romanian energy project that will take liquefied gas from the Caspian region to Europe, Romanian President Traian Basescu has said, Ukrainian media reported. Basescu said after talks held in Bucharest with Hungarian Foreign Minister Janos Martonyi that Hungary’s joining the project was obvious, since the transportation system which connects Romanian and Hungarian gas networks will be ready by the end of 2010. The Hungarian network, in turn, will connect with the Austrian one, and, thus, LNG from the Caspian region could easily be supplied to the EU countries. Under the Azerbaijan-Georgia-Romania Interconnector (AGRI) project, Romania, Azerbaijan and Georgia signed an agreement in Tbilisi on April 13 on the establishment of a joint venture. Azerbaijani gas will flow through pipelines to the Black Sea coast of Georgia, where the gas will be liquefied, and further by tankers to the Romanian port of Constanta. Gas will be transported to consumers in Romania and other European countries. The project is estimated at 4-6 billion euros. In June, Ukraine’s energy minister Yuriy Boyko said that Kiev intends to join the project on the deliveries of Azerbaijani liquefied natural gas via the Black Sea to Romania, and buy about 10 billion cubic meters of gas annually. The Ukrainian minister said a terminal to receive Azerbaijani gas is to be built in the Ukrainian town of Odessa at the Black Sea, but the project will take at least four years. OMV AG, the Austrian partner of the planned Nabucco natural gas pipeline, is now in talks with Azerbaijan's state oil company SOCAR about gas supply for the European Union-backed pipeline project, the Austrian Finance Ministry was quoted by Dow Jones. Nabucco, the EU and the six commercial partners in the project, intend to source up to 31 billion cubic meters of gas to Europe from the Caspian region as of 2015, bypassing Russia on the way. But the partners still need to secure enough gas to fill the pipeline in the first years. The Azerbaijani gas field Shah Deniz II, which is currently being developed, has been named an anticipated key source. Negotiations between oil and gas companies, Azerbaijan and the consortium developing Shah Deniz II are expected to begin soon, but all parties involved declined to comment on the timing or the volume being offered. Austrian State Secretary at the finance ministry, Reinhold Lopatka, said Thursday that negotiations have already started. Austria has a great interest in Azerbaijan as a supplier for Nabucco, Lopatka said, adding that: "The state-owned energy group SOCAR is in negotiation with OMV (over gas supply)". The Nabucco pipeline project aims to decrease the European Union’s dependence on Russian imports by bringing Caspian gas to a hub in Austria via the Balkans. The gas would be shipped to Europe via Turkey, Bulgaria, Romania and Hungary. 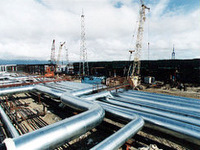 Construction of Nabucco will begin in 2011, as the recent gas crisis between Russia and Ukraine has convinced decision-makers of the need to speed up the project. The project, worth 7.9 billion euros, is managed by the Vienna-based Nabucco Gas Pipeline International. Partners in the consortium with equal stakes of 16.67% are Austrian OMV, Hungarian MOL, Bulgarian Bulgargaz, Romanian Transgaz, Turkish Botas and German RWE. The volume of Turkmenistan’s oil transported through the Baku-Tbilisi-Ceyhan (BTC) pipeline is around 200,000 tons per month, the president of the Azerbaijani state energy firm SOCAR has said. Rovnag Abdullayev reminded that SOCAR Trading, a SOCAR subsidiary, had signed agreements with Dubai state-controlled Dragon Oil and other companies operating in the Central Asian state on transporting Turkmen crude to the Turkish Mediterranean port of Ceyhan. The BTC pipeline opened in 2006. The 1768 km conduit transports oil produced from Azerbaijan’s Azeri-Chirag-Gunashli (ACG) oil block in the Caspian Sea. The pipeline allows exporting oil from the Caspian without increasing tanker traffic through the crowded Turkish Straits.